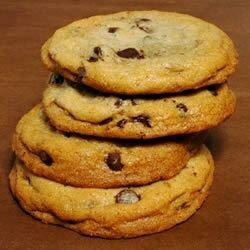 "Moist chocolate chip cookies!! " This recipe yields flat cookies with a crispy outside and soft/chewy middle. I used vanilla pudding mix and I really liked the strong vanilla taste. great recipe. I've made this several times. Big hit with my husband's co-workers. But I have been asked how to make them thicker. These cookies were delicious, moist, and beautiful. They came out so good I even took some to our new neighbors! :-) These are my new favorite chocolate chip cookie.